Among the dancers, marching bands and other lively participants from Sunday’s Dorchester Day parade, some of the most energetic marchers along the route were the candidates for public office. Incumbents and would-be office holders were eager to shake hands, ask for support and match a smiling face to the campaign signs that are an ever-increasing presence along Dorchester Ave.
U.S. Senator Scott Brown, up for re-election next fall, was the only statewide office holder to march in the parade. Brown led the parade after Mayor Menino, still on the mend from a leg injury last year, left the route after marching several blocks. Brown said he considers community parades part of his job and sometimes marches in four or five parades a day. “We spent a lot of time in Dorchester” during the special election campaign, Brown said, adding that he performed well in some traditionally Democratic areas of the city, including Dorchester’s Neponset neighborhood. Brown posed for photos before the parade stepped off from the corner of Richmond Street and ate a hot dog at an annual pre-parade gathering at Meetinghouse Bank, held by state Rep. Linda Forry, who is married to Reporter managing editor Bill Forry. One Brown supporter said the senator was famished, having just participated in a Ludlow Boys and Girls Club triathlon that same morning. “We’re going to battle for each and every vote when it comes down to it, but right now I’m just having some fun,” Brown said. The parade came just one day after each of the six Democratic candidates for Brown’s seat levied criticisms of his voting record at their party’s annual convention in Lowell. Brown said he had not heard any of the speeches from the convention because he was in the western part of the state. One of the Democrats looking to unseat Brown, Newton Mayor Setti Warren, also walked the 3.2-mile route from Lower Mills to Columbia Rd. 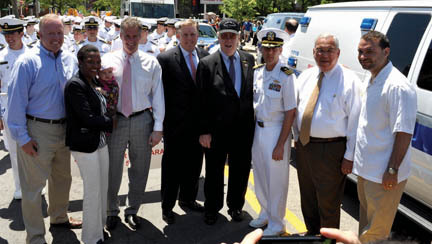 “It’s great to be here in Dorchester, [there is] great tradition in this parade,” Warren said. Warren said parades like Dorchester’s are chances to be in communities all across the state and to reach out and let residents get to know him. “I’m really pleased with the amount of support I’ve picked up not only here in Dorchester but around the state of Massachusetts,” the first-term mayor said. Warren said he will be going out to the Springfield area this week for unrelated events and may view some of the relief efforts. Parade-goers were accosted every few minutes by candidates running to for the District 3 City Council seat up for grabs this November. The parade was the coming out party for many of the candidates looking to succeed Maureen Feeney on the council. Savin Hill’s Frank Baker traveled the route backed up by a live band playing from the bed of a truck. Doug Bennett, a former at-large candidate who is running for Feeney’s seat, kept his energy up throughout the duration of the parade, crisscrossing the street and yelling “will you vote for me?” to spectators in Fields Corner. St. Mark’s Craig Galvin put on a similar show of handshakes, baby-kissing and sidewalk-to-sidewalk sprints. Marydith Tuitt said she was connecting with voters in the few seconds available along the avenue. Feeney, who decided against running for another term earlier this year, conducted on-the-street interviews at Peabody Square for BNN-TV, which cable-casted the event live. Nearly each incumbent at-large city councillor appeared for Dot Day: Stephen Murphy, John Connolly and Felix Arroyo. City Councillor At-Large Ayanna Pressley could not attend because her mother is ill, said supporters, who fielded a strong contingent to march in her stead. Also out shaking hands were At-Large challengers Will Dorcena of Hyde Park, Sean Ryan of Jamaica Plain, and former At-Large Councillor Michael Flaherty, seeking to reclaim one of the four at-large seats.